In the 1960s, William "Hoss" Allen was one of the most powerful men in the Rhythm & Blues music industry. He was a disc jockey at WLAC radio in Nashville, the highest wattage clear channel R&B station in the country. He was also a music publisher, record label owner and record promotion man. His first outing into the the record world was with his Athens record label in the late 1950s. Finding it hard slog in a competitive field, he folded the label in the early 60s and went to work for Chess Records. Record promotion involved a lot of traveling though, and Hoss was soon back in Nashville at WLAC. 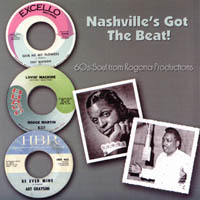 By 1965 he had started a new label, Hermitage Records, and the Rogana production company as well. Rogana was designed to license Allen's productions to other labels. The idea being that he had access to more artists than Hermitage could handle. By the early 1970s, the R&B indies were having an increasingly harder time of it. FM radio, Disco and the major labels all conspired to bring an end to the classic Soul Music era. Hoss Allen stayed on at WLAC radio through the early 1990s, hosting their Gospel Music programming. The station soon converted to talk radio and went out with a whimper rather than a bang. Hoss Allen passed away in 1997, but left a legacy of a life lived in the Rhythm & Blues firmament. The music remains richer for his participation.